The Sarjeant Gallery Te Whare o Rehua Whanganui has been lent a stunning George Sherriff painting. 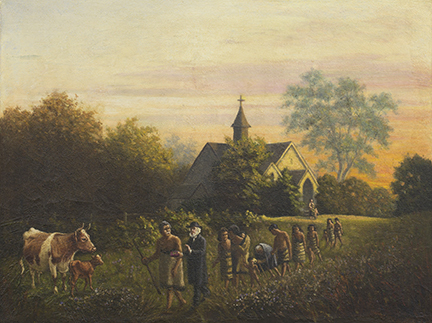 It is an oil on canvas and is captioned “Richard Taylor with Hoani Wiremu Hipango and his family, walking by the third Putiki Mission Station church” and was painted about 1870. The canvas glows with a late afternoon light and there is a calm stillness about the work. It shows people who are happy and at ease with each other walking and talking together as they pass an early version of the Putiki Church. The European man in the painting is Richard Taylor who was the Anglican missionary at Putiki Church from 1843 to 1873 and Hoani Wiremu Hipango who walks with him, was an esteemed leader of Ngati Tumango, of Te Ati Haunui-a-Paparangi. They must have known each other well, as in 1855 Hipango travelled with Taylor to England. There he met with Queen Victoria and Prince Albert and gave them gifts from the Whanganui tribes. The people that follow the two men are likely Hipango’s family – he had nine children. Reverend Taylor was well-known in the North Island in the 1800’s. He was present at the signing of the Treaty of Waitangi in 1840 and in fact it was he who prepared the final parchment text the night before it was signed. He was skilled at negotiating conflict resolutions and brokered many settlements at the time. He also founded a small hospital at Putiki and a school for boys which went on to become Wanganui Collegiate. The Whanganui suburb of Taylorville is named for him. The painting’s creator George Sherriff is an interesting man. He was born in Brighton, England in 1846 and joined his family in Whanganui when he was 16. His father Francis was a Whanganui farmer but George must have been very keen on art as he went to Melbourne to study and then travelled back to England to attend the West London School of Art, and later the prestigious Slade School of Animal Painting. Upon his return to Whanganui in 1868 he set up a studio in Ridgway Street and there painted many works featuring animals, landscapes and local people such as the two magnificently grand portraits of Mrs Alexander and Mr Alexander which hang in the Alexander Library te Rerenga mai o te Kāuru at Queens Park next to the Sarjeant Gallery. That same year George was instrumental in fighting a Ridgway Street fire that could have wiped out Whanganui’s burgeoning CBD of the time. In the archives at the Alexander Library I discovered The Wanganui Chronicle mentions George Sherriff several times and runs quite a long interview with him printed after he had returned from a four year sojourn in England. The interviewer wants to know how things are looking in the art world in Europe and although Mr Sherriff modestly states he is ‘only an amateur’ he submits and has quite a gloomy view of things. He says: “I have for a long time feared that the time was coming when artists would find it very difficult if not impossible to earn a living by their profession, and my recent visit to the old land has confirmed those fears” He points out that “the wealthy, instead of collecting works of art, spend their money on extravagant motorcars, yachts, horse racing, bridge and other forms of gambling”. 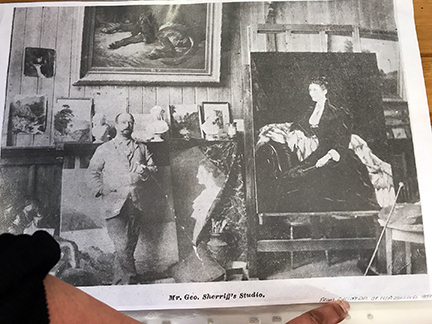 With the interview is a large photograph of Sherriff in his Ridgway Street studio. Just to his left leans the very grand portrait of Mrs Alexander – it looks as if he might just have put the finishing touches to it. One of George Sherriff’s many achievements is the Veterans’ Steps which commemorate the Imperial and colonial troops who died in and around Whanganui during the New Zealand Wars. The sleeping lion which rests on a plinth at the base of the steps actually used to sit on the top of the hill – at the site of the Sarjeant Gallery – and was moved in 1919 when the gallery was constructed. George Sherriff carved the lion despite never having had training or experience as a sculptor. The lion is sculpted from two blocks of stone from Mt Somers in Canterbury. His deep understanding of the animal form that he would have studied at the Slade School is clear. It is a very impressive monument, probably better described as a shrine, for the remains of some of the troops who were killed are interred underneath.